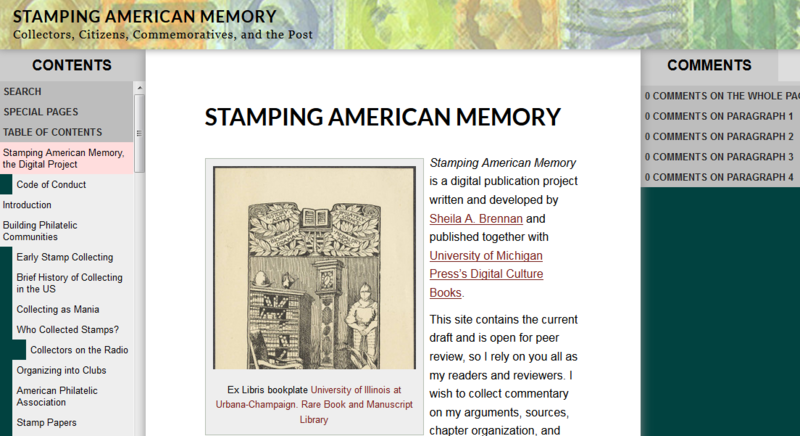 Finally, I have real progress to report about my digital monograph, Stamping American Memory. 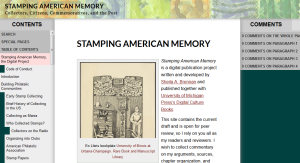 I finished an posted a fully-revised version of stampingamericanmemory.org, in WordPress + CommentPress in the summer. The next stage is peer review. In my work plan for the project, I asked for an open peer review process to occur within the posts and comments of the project. I wanted scholarship about public dialogs to include dialog as part of the review process, and as part of my efforts to write in public. University of Michigan Press is revising their own procedures for the Digital Cultural Books digital humanities series, but an open peer review, solely, will not satisfy the requirements of their board. Early in 2015, both blind and open peer review will occur simultaneously. I requested that the blind peer reviewers read and review from stampingamericanmemory.org, and not from copies of pages exported into Word, because many of my revisions, particularly content structure, were based on the format in which I am publishing. Michigan Press is handling the blind and I’m in charge of the open. Michigan is not quite prepared to help scholars with marketing their digital projects for this type of process. Luckily, there are examples of successful open peer review projects and author-editor driven outreach, including Writing History in the Digital Age, Hacking the Academy, and Planned Obsolescence. The next step is for me to ask you, my readers, to read, comment, and help make this project better. My goal is for readers to see that stamp collecting was not just an insignificant hobby practiced by a few obsessed individuals. Rather, that stamp collecting provides a way to examine how millions of individuals and the federal government participated in a conversation about national life in early-twentieth-century America. As a collectible, stamps transformed into miniature memorials through the act of being saved. This study draws upon sources known to historians and to philatelists, separately, that haven’t been adequately brought together in one piece of scholarly work. My goal is to bring together philatelists and historians, collectors and students, not only through the sources I interrogate, but through this platform by encouraging discussion among readers. Stamping offers new interpretations of the US Post Office Department as a producer and distributor of historical narratives, through the commemorative stamp program. Can I convince you that the USPOD emerged in the early twentieth century as one of the most active federal agencies engaged in public history making prior to the New Deal by selecting scenes and figures from the American past for printing on commemorative stamps? I tried to revise this “monograph” so that each major section (chapter) stands on its own, making it easy for a reader to hunt and peck around in the sections that most interest them. Over the next few days, I will reach out to some of you directly to ask for your input. Hope to discuss this with you soon, in public.